The Divergent actress, who also starred in The OC and The Secret Life ofA� the American Teenager, reportedly makes her own toothpaste, lotions, face oils, medicines and cheese. a�?I started studying the lifestyles of indigenous cultures, and through that, herbalism,a�? she was quoted as saying. Her toothpaste, which she makes with clay and coconut oil, can be swallowed and is supposedly good for health. a�?Ita��s an entire lifestyle. Ita��s appealing to my soul,a�? she said. The Shake It Off singer, who is currently dating Tom Hiddleston, is said to be an expert when it comes to making snow globes. The star has in the past handcrafted exquisite snow globes for friends and family, as presents. She even posted a picture on Instagram, of a row of six of them, made with Mason and jam jars. This might not be strange, but it certainly is interesting and sweet. The hotel heiress, whose glamorous life sees her jet-setting across the world, is reported to be a hunter of frogs! The reality star, who supposedly has a tomboyish side to her, traps the amphibians but releases them back into their habitat after a while. a�?I love frog hunting. I go to my ranches. I have one near Oakland, California, and another in Nevada, and I own an island. So I catch frogs and put them in a bucket and then let them go,a�? she was quoted as saying. 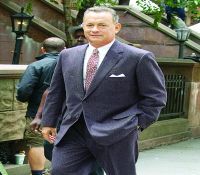 While most stars are always on the quest for shiny new gadgets and toys, Hanks has a fascination for the faithful and trusty typewriter. The legendary actor has a collection of 200 pieces that are still in working condition. He was once bribed into doing a podcast interview in exchange for a 1934 Smith Corona. Hanks even created an iPhone app, Hanx Writer, which recreates the experience of working on a typewriter, complete with the appropriate sounds and font. played a lot of Barbies, my daughter and I. I used to test characters on her, yeah, playing Barbies (sic),a�? he saidA� on Jimmy Kimmel Live.